One of the fastest and most effective anti-aging treatments is to have your teeth whitened by your dentist. Our dentists use Philips Zoom Teeth Whitening which provides up to 8 shades whiter teeth in 45 minutes, and treats the whole tooth not just the external enamel. The advantage of having professional dental whitening, over using a store bought do-it-yourself product, is that you can have a whiter smile in a fraction of the time. Our dentists also ensure the procedure is safe and it is the teeth and not the gums that are treated. Whitening treatments contain varying quantities of hydrogen peroxide which may cause damage and sensitivity to the gums if not used correctly. This is one of the reasons that users of over-the-counter treatments often fail to complete the two week course needed for their diy product to be effective: their gums become sore or sensitive, and they stop the treatment before it makes a discernible difference. 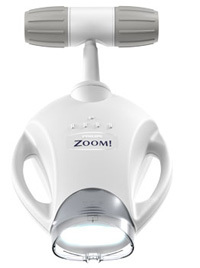 One of the benefits from using Zoom Whitening is that it contains the ingredient Relief ACP (amorphous calcium phosphate) which has been clinically proven to protect the enamel and improve the smoothness and lustre of the teeth. First, Dr Chou will ensure your gums are covered with a special protective coating before he applies Zoom’s unique hydrogen peroxide whitening gel. This gel will gently break up the molecules that you see as stains on your teeth and also those that are deep inside the tooth that you cannot see. Next, Dr Chou will shine the intense light of the Philips Zoom WhiteSpeed Whitening LED Accelerator onto the gel, which will accelerate and improve the whitening results by up to 40%. Contact Vital Dental Care in Camp Hill today for a brighter, whiter smile that’s kind to your teeth!